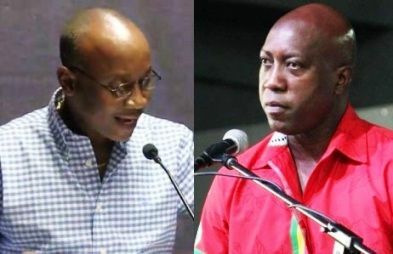 ROAD TOWN, Tortola, VI - Less than 48 hours after Honourable Myron V. Walwyn (AL), the Education and Culture Minister, released a video clip announcing that he will be seeking the Presidency of the ruling National Democratic Party (NDP)—at its June 23, 2018, internal elections—sections of the public are condemning the decision. According to the outspoken social commentator, “if there were any doubt in the minds of the people of these Virgin Islands (VI) and specifically in the minds of the NDP supporters, as to who believe they have a right, if not an entitlement to lead the party, it should be crystal clear now. 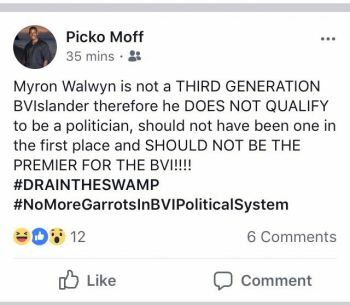 He told this newsroom Hon Myron Walwyn’s video announcing his bid for the NDP leadership, demonstrates that he is unfit for leadership. “Unless I missed it, when did Hon. Dr D. Orlando Smith, claim he was stepping down as President of the Party; when did the Premier declare that he will be going into retirement and will not seek to be re-elected; when did the Premier come to the people of the VI and shared with them his intentions as it pertains to the leadership of the country,” Mr Skelton-Cline questioned. He said, “If you don’t know how to be under authority, you’re not fit to be in authority…it is the story of David and Saul”. This is democratic society sir....should a person hold the office until death? As far as I’m concerned every 8 years it should have a vote by the delegates. At least someone among us have the cohones to tell it like it is. This guy is very calculating and will be dangerous if given even more power. Mycon is the biggest opportunist known to we be wee eye; for one, all the ideas he has halfa$$ implemented in education, came from others he has not the respect to acknowledge or credit them for their work to this day. Just took them and come out saying how innovative he is. This man is clueless except for stealing other people’s ideas; he is not even doing a good job at executing them. Never, he is quick to come to the public to glot about what he has done. Everything he does is solely to obtain more power, and nothing else. Mycon only care about one thing- himself, everything else is a sham. Full stop. I want to see how Myron is going to clap back and you know he will. NDP is not the team for we, final. Why are they having an election? The NDP failed to bell that corrupt cat. Everything under this man's ministry needs investigating. Too many shady deals. I agree. This shows that what we have been hearing is true. This individual is after premiership, but we do not want to join certain organizations, so we have better be mindful of what he stands for. He has already made some interesting statements about BVI belongers and that position would really give him the authority to put his words into action. When I saw the clip, my first thought was that the two doctors were retiring (as they should (:-), but partner cannot wait. Oh crap! Too much drama going on in the BVI and the world is watching. People who cannot trace their familial roots in the Virgin Islands should not be in the house of assembly. Meh son those guys needs to be in the JHOA. Kedrick's mother is a virgin islander. Don't you remember ME saying that the NDP will self-destruct before the next elections? Stay watchful. Oh hush- what I respect about Myrun is he keeps it real . While others are covert with their actions ; he lets you know what time it is . With or without NDP this man is a born strategist . LET THE GAMES BEGIN !!!!!!!!!!!! Could it be that the Dr. Hon Premier D. Orlando, AL and MoF apprised members of the caucus that he was stepping down at end of this term? Is the MEC anticipating that the Premier will step aside and is trying to be the first out of the gate? Is the loyalty chain broken? Is this a palace coup? Would like you to explain to the country that you left the bvi ports broke. The government diverted 8 million dollars from the port. Talk that also. How can myrun want to be premier and he under investigation for the wall???? It was a big mistake when persons without any parentage relationship to these islands were allowed to be a part of the house of assembly. They will not have allegiance to the Nationals of this country. We are experiencing it all the time. That is why this territory is so messed up. Hope that is corrected with the next constitution review. You are beyond silly. It is persons like yourself that has kept the BVI from progressing. A BVI Islander is BVI Islander. None is more important than the other. You are so right spirit. The other mistake was naturalizations and creating so called belongers. These people have their own interests which have nothing to do with being virgin islanders. I prefer Ronnie out of the two. He’s the man to help fix the finances. Fraud Swine.... You clearly stated on record that you are not voting for NDP next election. So why are you soo concern about their internal elections? A lot of us who do not like NDP are concerned, so why should Claude be any different. He is a national of this country and have a damn right to be concerned. A guy who said he can no longer protect the people is vying for government leadership. An intelligent person would know to step aside.
. The governor was not "elected" but "selected" . Chose your battles carefully. Slow down wait not so fast less you force the hand of God. It is he who put you up and it is he who will take you down. Be anxious for nothing but by prayer and supplication let your request be make known unto God. Look it up and you will find peace if you do this. Slow down let protocol take it's course. I will not support him at all much less as Preimer. Too many question marks ????? Also, his arrogance and obnoxious demeanour is a major turn off. People understand he is not the only candidate tou have Ronnie and Kedrick also running for the positiom.,personally i feel Myrpn is best he has that gravitas and is demonistrated each day. 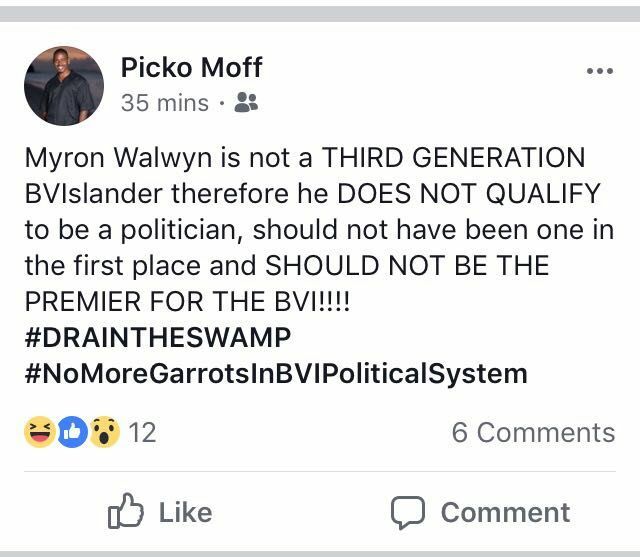 Claude is talking about Myron wanting power.He sued the government for a position for which hos contract was up and is not his alone .The position he held as managing director of Bvi pa was policitical he had anf still dont have any qualification for or in that related field Also claude breaks the commandments often cause every time his two uncles buy an expensive ride he must have one also. Cline need to stay in his lane.Myron is the best person for the position, you all can say what you want but, Myron is the smartest one in the NDP. BVI please wake up. All I am seeing is angry, hate and jealousy. Leadership matters. The only leader I see is the Hon Dr. Smith. Humidity and caring. I don't know how he handle see his country destroyed by the storm. This honorable leader went through the storm had damages just like us still not living at home. Working hard to get BVI back on it fee. Please of the BVI turn to God. If we continue like this we will be facing another storm. Pastors, It is time to preach the uncompromising word of God. A lot of us are in destress not because of the government because we are in perilous time. God is coming soon. Don't let us go to hell there is a wonderful place to gain after all this suffering on earth. Just take a lot outside and on the sea. I am in full agreement with both tola and got your back. But to take it a little bit further the same preacher should explain what happen to the over run cost of the cruise ship project and american greed. BAM! If I remember well the same bible states that he who is without sin should cast the first stone. claude go sit your a** down what are you scared that he will beat your uncle for the position? well I can bet you he will be the next leader of the party. I totally agree that Myron is the one to lead the NDP. He is not fake and keep it real. You either love him or hate him. Like it or not, get mad and have your hissy fits, he is going to be the next leader of the BVI. They are not god and they are not a virgin islander.